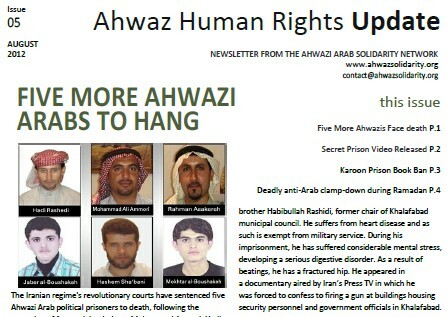 The August edition of the Ahwaz Human Rights Update has now been published by the Ahwazi Arab Solidarity Network. 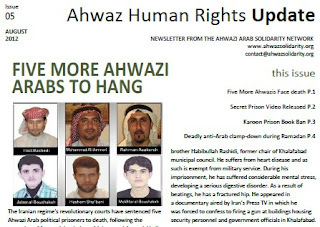 The latest monthly update covers the latest news on executions of Ahwazi Arabs and the worsening conditions facing political prisoners in the notorious Karoon Prison. The report also covers the secret recording of a video by four Ahwazi detainees of Karoon Prison ahead of their execution in June in which they appealed for international intervention to halt the Iranian regime's execution campaign against Arabs. The victims of a Ramadan clamp-down on Arabs, including the killing of a 12 year old girl by security forces, are also revealed in the fifth edition of the Update report.